Cheesecake for breakfast? Yes please! 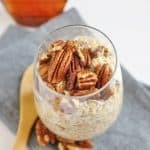 This rich and creamy Maple Pecan Cheesecake Overnight Oatmeal recipe is so simple to make but will surely make waking up to breakfast quite the treat! …Perhaps more, and I have no problem with such a title by any means. Overnight Oats are my THING, and they never ever get old. EVER. 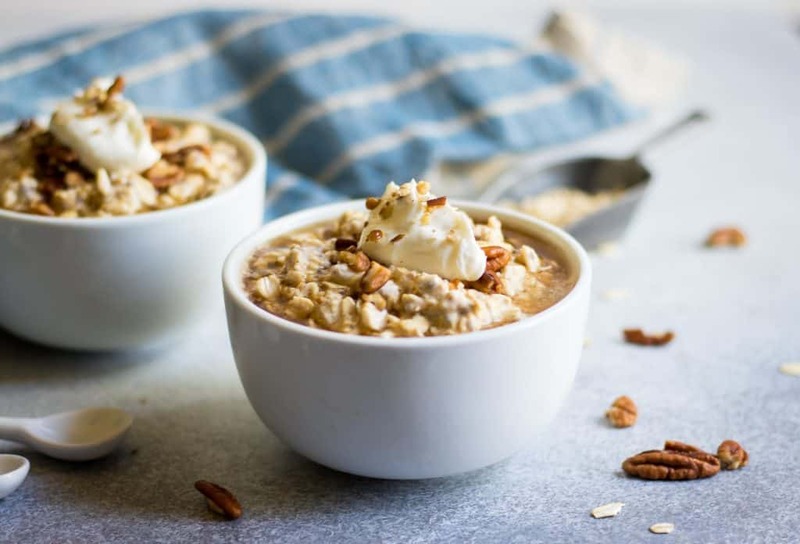 Every time I say I think I have created my last overnight oats recipe, I know that just means something even better is yet to come because that seems to be the trend. And today is proof of just that. Recently I was whipping up some oats to prep for the next several busy days ahead. 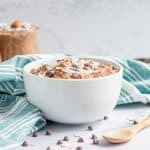 To be honest, the Banana Bread Overnight Oats and Peanut Butter and Jelly Overnight Oats are my all time favorites–classics obviously–but most of the time I play around and toss this or that in to make them slightly different each time. On that particular day, I didn’t have any fruit that was good to put in, so I just tossed in some nuts and pretty much called it a day. How boring is that? Yea, that’s what I thought. I looked through the cupboards and the fridge to see what else might be tasty to add to these dull oats. And there it was: cream cheese!! How had I not used cream cheese in my oats before?! I mean, I love a good cheesecake so combining the flavor with my favorite breakfast was an amazing idea. I added a dollop into the mix and stirred it up. The only problem after that was waiting until the next morning to eat them. But let me tell you it was soooo worth the wait. Sooooooooo worth it! 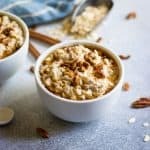 If you are a cheesecake fan, then these simple, creamy oats are for YOU! 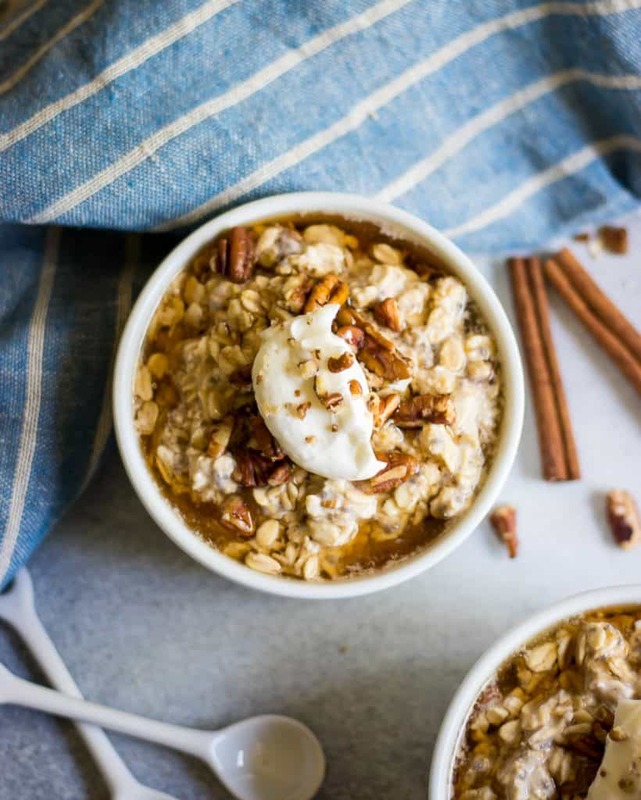 Needless to say, these Maple Pecan Cheesecake Overnight Oats are most likely only the beginning. I am trying to think of any overnight oats recipe that wouldn’t be better with a nice spoonful of cream cheese!? For instance, why have Cherry Almond Overnight Oats when you could have Cherry Almond Cheesecake Overnight Oats?! Doesn’t that sound even better? So here is what I guess I am gonna need you to do. 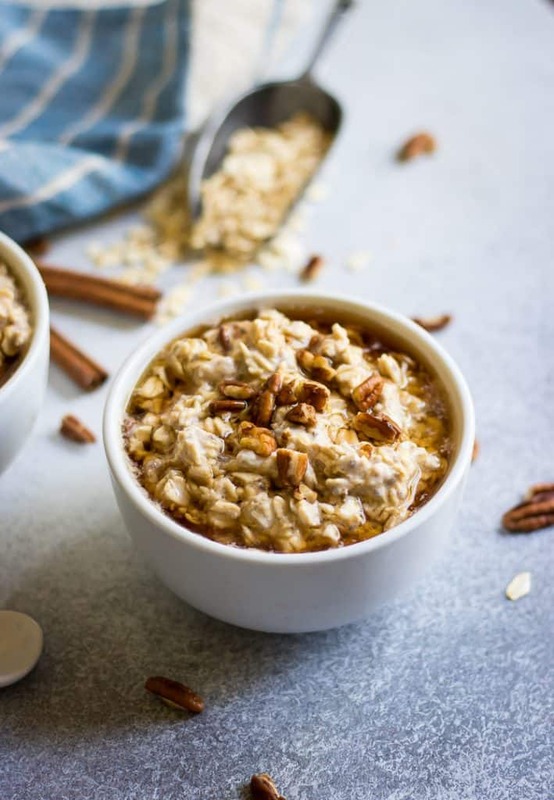 Go ahead and take all the overnight oats recipes from the blog, stir in a spoonful of cream cheese and decide if it works or not and then report back, mmmm k? Clearly a tasty mission, but don’t worry if you don’t have the time, I am sure I can get right on that as well! Something pretty cool about this recipe, is that a little bit of the behind the scenes was captured in the making. I thought I would give you a peak of what it really looks like when I shoot recipes and some secrets as well. I got to be part of a little project with a friend and photographer, Robert White. He happened to also be our wedding photographer back in the day, and my sis’s as well. 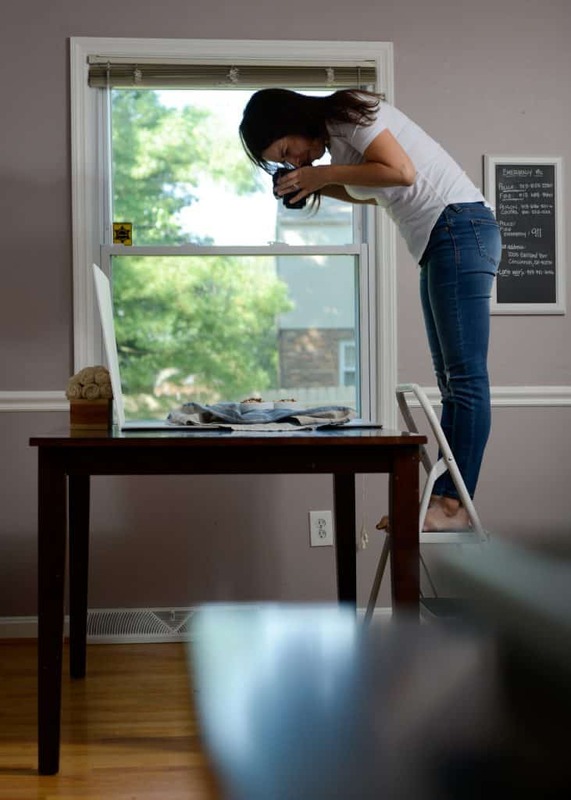 We connected to do some behind the scenes of what it looks like to do what I do as a food blogger. I thought that would be so cool to share with you because honestly, you often see just these photos of the food styled beautifully but seeing how it came to be can tell so much more. I always, always shoot in bare feet. There are times my feet end up on the table so its better than putting shoes up there, right?? By the end of this shoot, these oats were far from edible. I tried to freeze my maple before shooting but it didn’t quite sit long enough, so it wasn’t staying on top like I wanted. So by the end there was so much maple syrup to get the look I wanted it was almost nauseating. I even at one point sipped a bit out because I overdid it. Yes, I drank maple syrup. It drives me crazy, but my kitchen is purple. It was supposed to be a light gray but it is clearly purple. I always find it makes the tone of my photos off even more before I edit them. I take almost all of my photos between 10 am and 1 pm. This is when I get the best light. So I am in big trouble when Sam’s nap time shifts in the next several months! Those exact cinnamon sticks have been featured in at least 10-15 other recipes on the blog. The white spoons in this pic were the first real props I ever bought for the blog. I saw them in another blogger’s photos and decided I HAD to have them. I almost never take pics in jeans, but cleaned up a bit for this one. Usually it’s just good old sweats or leggings! Trying to think if there are any other fun little bits to add, but not coming up with anything as of now. I will add more if I think of them. 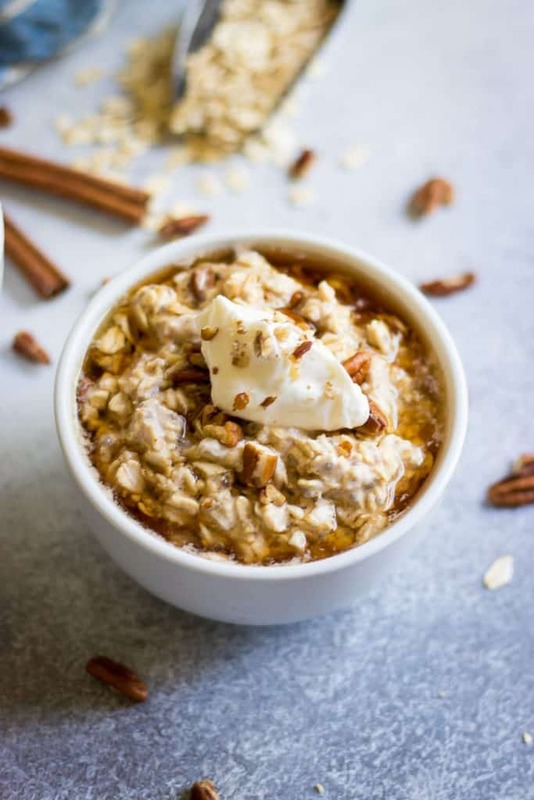 Enjoy these delicious overnight oats, and for more amazing pics from Robert, check him out on Instagram as well! In a small bowl or jar that can be sealed, combine all ingredients and stir well to combine. Seal container and refrigerate overnight or at least 4 hours. Eat chilled or heated up and add in a splash of extra milk if needed if oats seem too thick in the morning. Adding a touch of cinnamon to these is amazing as well! Feel free to toast the pecans for a few minutes in the oven. I love seeing the behind the scene images! This honestly tasted just like cheesecake! Even better though, it was healthy and a yummy breakfast! Well, it’s certainly not Oreo Cheesecake from Cheesecake Factory… but it is amazing, I agree! I love maple and pecan together. This looks incredible!! Love the sneak peeks and fun facts of the behind the scenes of the shoot! And yum to this recipe! I love seeing other blogger’s its as well–great for getting ideas! 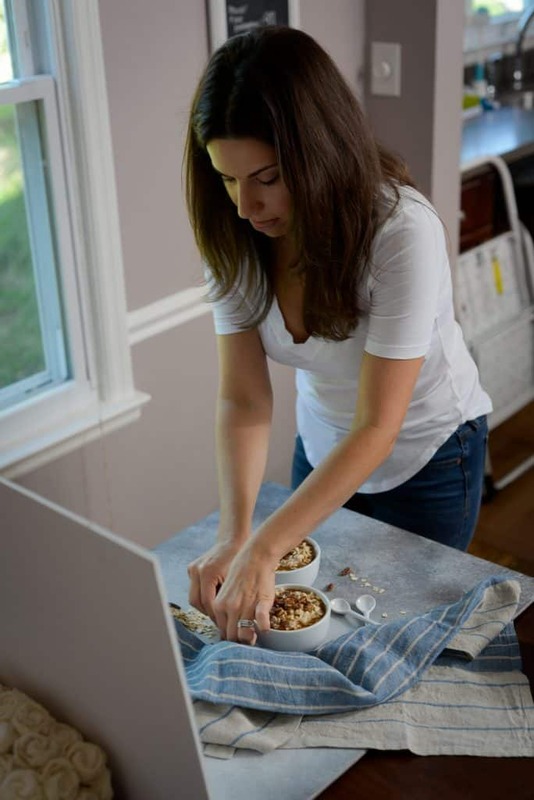 I love these special behind the scenes pictures <3 And this most delicious overnight oats recipe! I toasted the pecans for this recipe and my kitchen smells so wonderful. Thanks for the suggestion! Always the best especially during fall! how many calories would you say this is? Not 100% sure. I don’t focus on calories because I had my own issues with food for so long. But a lot of my readers just plug the ingredients in to a calculator to find out. Sorry I’m not much help!